Air quality in Washington state region, as affected by wildfires. 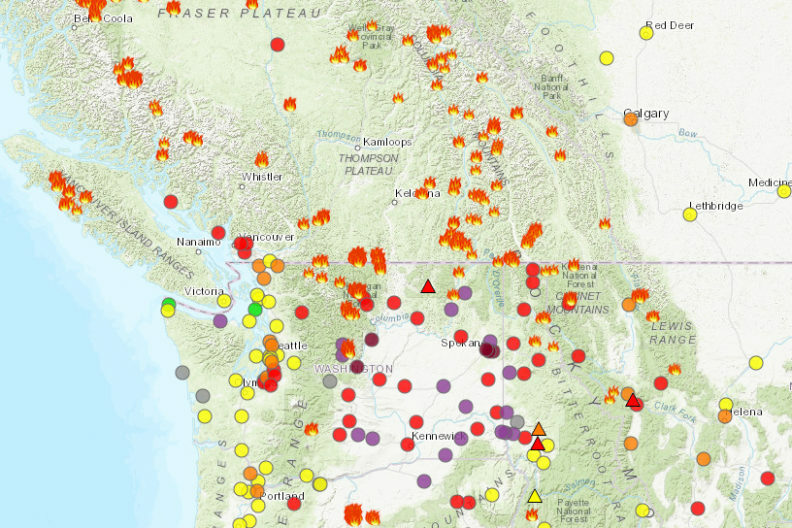 The air quality, as everyone can see, got significantly worse over the weekend on the Pullman and Spokane campuses. (The adjacent image can be found at the Washington Smoke blog. Starting Sunday, Facilities Services on the Pullman campus transitioned the HVAC systems in all buildings, where it was possible, to the air-recirculation mode. This allows the systems to recirculate more internal supply air, versus bringing in air from outside. Unfortunately, not all buildings can be shifted to recirculate. Some lab buildings require 100% outside air all the time. Cole asked faculty and staff to help by keeping building windows closed to limit smoky outside air from coming in. He also asked people in labs to “pull the sashes down” on fume hoods whenever they are not in use. “All hoods are equipped with filters, so air quality in the hoods will not be the issue, but we just want to limit the overall amount of outside air to a minimum,” he said. Jon Schad, WSU Spokane Campus Facilities, similarly noted that campus does not have any operable windows, and that outside air intake has been adjusted to minimum where possible. Precautionary steps regarding HVAC systems vary from campus to campus, based upon the air quality. For example, air quality on the Vancouver campus is currently considered “moderate,” so similar HVAC steps are not necessary, at this time. Older adults, pregnant women, children and people with preexisting respiratory and heart conditions may be more likely to get sick if they breathe in wildfire smoke. If you experience any signs of respiratory distress or other health concerns, contact your health care provider. Use public transportation rather than walking or biking. Keep indoor air clean by closing windows and using an air filter and air conditioning. Make sure your air conditioner’s fresh-air intake is closed and the filter is clean to prevent outdoor smoke from getting inside. Don’t add to indoor pollution. Avoid using candles, fireplaces or gas stoves. Do not vacuum, because vacuuming stirs up particles already inside your home. Do not smoke, because smoking puts even more pollution into the air. If you have asthma or another lung disease, follow your doctor’s advice about medicines and your respiratory management plan.